“Real Luxury Organic Bath Oil” – is what it says! You know me – always on the look out for properly luxurious bath treats! 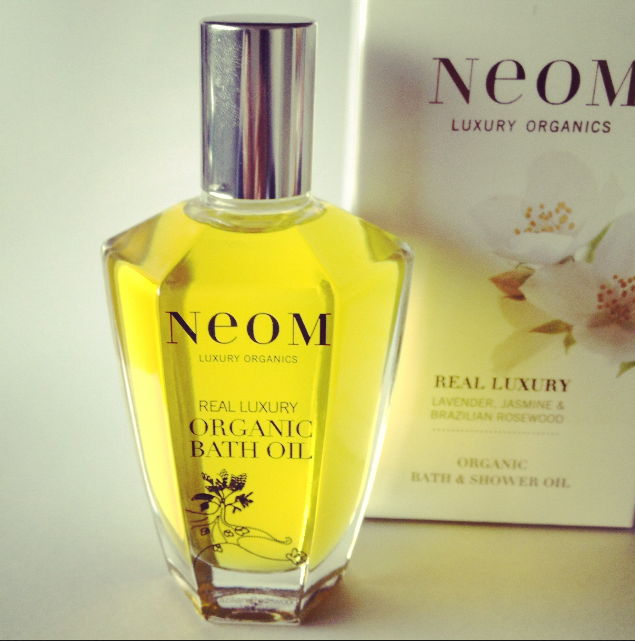 Another one to tempt you with – Neom Luxury Organics – and this one is simply called “Real Luxury”. So far, so good. The packaging also gets top marks; pretty outer box and a gorgeous heavy glass bottle. The oil inside is heady and romantic – not too heady, as some oils can be when they contain loads of Jasmine, but just exotic enough to make this feel special. As with the Aromatherapy Associates oils, a little goes a very long way. I know that phrase can be a bit overused, but the percentage of essential oils in this Neom product is incredibly high – 30%! So actually, you don’t really want to be using too much – I use just one capful for my huge bath and that’s plenty. This is a brilliant brand to take note of if you’re into your luxury organics and great for gifting, too, as the packaging really looks the part. Previous Post My Interview for “The Inspirations”!